A tired thing, the simple camera – to promote it is a struggle. After all, there are only so many ways to paint a picture of a product that takes them. GoPro has done it, though. So much better than everyone else trying, in fact, that it is now the world’s fastest-growing camera company. It went public in June of last year, with a valuation close to $3 billion. A wild move for any tech start-up, but the sort that surfer CEO Nick Woodman loves to make. The GoPro has left the droll arena of “product for purchase” and entered that most fascinating realm of something more – more desirable, more essential, more clambering into your mind and poking your brain until you buy one. Purchasing a GoPro signals that you are an adventurer and that adventuring is on the cards, that the unknown is to become known, that life is wild and that you are to be a part of stories needing perspective beyond the reach of any conventional lens. It is this individuality given through its viewpoint, the immediacy of the experience. It is the ability to let the world dip into said experience, see your movements, discover what thrills you and enjoy life as you – if only for a minute. Its viewpoint is so iconic that any video from that perspective, be it GoPro or a competitor, is known as a GoPro-angle. It has monopolised the POV-filming market, popularity fuelled by the promotional work of legions of human billboards willingly enlisted throughout the company’s monolithic ascension. The square cameras with their transparent plastic housing are now so ubiquitous that they no longer stand out at sporting events and on film sets, having methodically wormed their tentacular mounts firmly into every nook of the media world, becoming so very much a normal feature in the process. The number of GoPro’s unique applications is unknown, but it is far greater than the extreme sports markets into which it first tapped in 2004. It conquered those audiences without intrusive branding or forced promotion, carving levels of market affinity for which companies spend decades searching. Of course, some find it easier – an athlete’s foot cream manufacturer, for example, might never reach the levels achieved by Beats by Dre. Each company has a story to tell, and it is up to them to make it grip you. 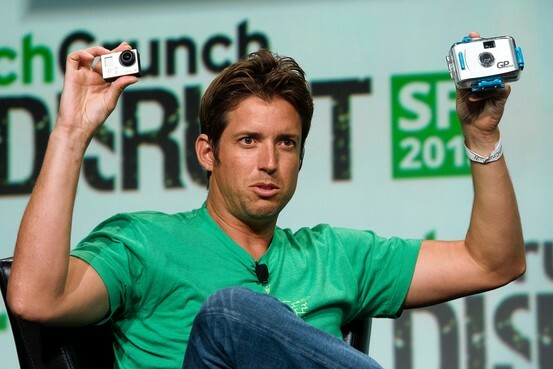 GoPro does not sell its own story, but those of its customers. No waiting for the next publication, advertising budget, no CEO/consumer disconnect and no risk of negative reception. Rather, endless reels of satisfied customers. And if they break the product, they were simply being too extreme! Woodman has spawned a wonderful, self-expanding global medium of extreme and immersive entertainment, into which the public can dip without taking out life insurance. Soar in wingsuits through Tianmen Cave? Ride the winning run of the Red Bull Rampage? How about a freefall from space? GoPro permits you to peek. Yet alongside all this death-defying fun are those who use GoPro for more grounded projects – the company’s first Superbowl commercial, for example. That baby does not achieve nearly as much air as snowboarders backflipping across canyon gaps on the world’s edge, yet the energy of the perspective is entirely equal. There is braveness in choosing to risk alienating your original audience on the world’s biggest advertising platform yet it worked. Like all the best storytellers, GoPro had established itself enough to divert from its original style. Their worldwide fan-base run the world like top journalists, revealing local treasures, secret spots and intimate moments that would never allow the same involvement from a full-sized camera. It is a lens for people to jump right into your life, or for you to jump into others – an ever-growing library of visual tomes from the hands, foreheads and chests of GoPro’s ever-loyal adventurists. Our age is self-documenting, and every day sees new footage in the thousands of hours, spreading across social media, ranging from essential to inane, thrilling to tedious – but they are all stories. The New York Times has shown that the brain finds stories easier to remember than facts and figures. Coupled with its propensity for visual stimuli, it’s easy to understand the success behind GoPro’s globally fuelled, consumer-led, endless show-reel. The advertising bank is never empty; it is the dream of marketing departments. In this era of multifaceted smart-tech, GoPro is defined by its singular use. Wearable tech is a prominent trend and the market for temporary experiences is a ballooning one, but as companies conceive more complex ways to integrate these entities, GoPro reclines and laughs. Now expanding into a media business, the GoPro Roku player was the basis behind their IPO and will exist as a global narrative hub beyond its extreme sport origins. Glance at GoPro’s Youtube library and you see a similar expansion – mainstream sports like hockey and swimming, filming for television and cinema, behind-the-scenes footage from Fast 7. And like any library, the classics will always be dusted off for a read by new generations. Kevin Richardson’s Lions – The New Endangered Species was released in November 2013 and shot entirely on GoPro, but has experienced a recent revival and currently sits on 26.2 million views. Mythbusters has attached them to launched, burned and exploded things over the years. They have been dipped in liquid nitrogen, chewed on by pigs and taken out by chimps – the rousing stuff of advertisers’ dreams, delivered by the average user. GoPro has laid the schematic for marketing agencies, which are always looking for ways to support and grow clients’ public images. GoPro runs on content produced by its millions of users, and in doing so it is self-sufficient. That is why we teach our companies the importance of internal content production, which these days can be incredibly easy. Most of them already have GoPros, no doubt! The modern consumer is wise enough to know who the real deal is, and who is just a product of corporate fiction. They need to feel the connection that justifies engaging with this company in particular, and not the other fifty vying for their money. There will be competitors and they will gain ground, but never enough (or so it looks) to reach the GoPro zenith. And I don’t suppose Woodman is the type to care. The guy who recently upheld his $230 million promise to an old college roommate is most likely on his favourite beach in Bali, waxing his board, lounging under a sun that has competitors sweating. The camera is just a means towards the content, I’m sure he would tell you – content found in people and not presentations. This piece was written by SQN’s newest team member, PR and Communications Coordinator Matthew Perryman @mflperryman. He comes to us with a background in writing and publishing and loves everything bicycle-related.